If you are a cannabis user, you are probably already acquainted with the effectiveness of a glass bong or a dab rig. You can hardly imagine enjoying your smoke session without the magnificent invention, and rightly so. According to a number of studies, water filtration is necessary for protecting our overall health as we engage in smoking, especially cannabis smoking. It helps clean the smoke by removing the harmful compounds. Who knew water filtration could be that important? However, few people tend to change dirty bong water, and even fewer know the health effects of such negligence. Of course, dirty bong water together with a dirty bong can compromise the taste of your cannabis herb or other herbs, hence ruining your smoking session and experience. Below we take a look at what happens when you refuse to clean your water bong or dab rig and change your bong water. Dirty bong water that remains unchanged for some time can be likened to stagnant water. Stagnant water can be defined in a number of ways. However, it generally means water that sits in a single solitary place and does not flow accordingly. Hence, the reason stagnant water is also known as standing water. Such water is the perfect breeding ground for parasites, bacteria, insects and even mold. That said, a dirty bong is not just holding dirty water, it is also holding stagnant water. Such conditions allow the growth of harmful pathogens that are known to lead to the development of respiratory diseases. It is important to note, that it does not take a long time for these pathogens to infiltrate your glass bong and grow. After a day of not cleaning out your dirty bong water, what is known as biofilm tends to develop at the surface of the water. A biofilm is essentially the evidence of the microscopic organisms thriving in your bong water. These microbes or microscopic organisms include bacteria, fungi, and viruses as previously mentioned. 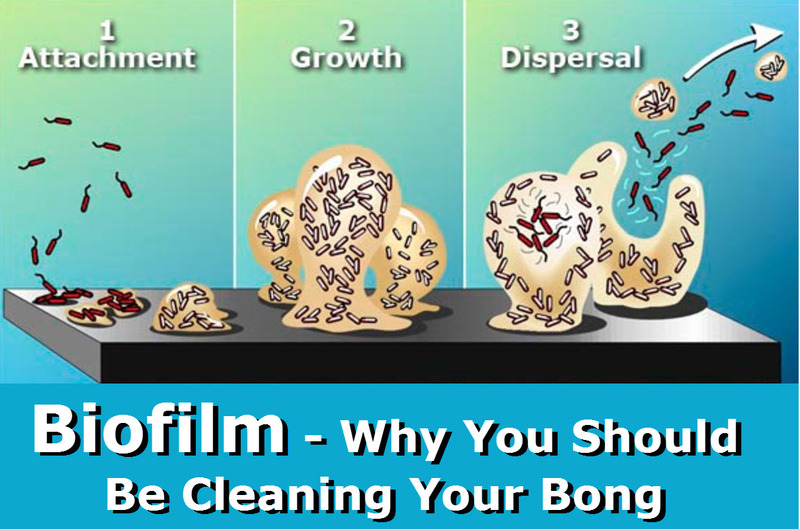 Notably, microbes that eventually grow to form biofilm tend to be more difficult to treat. Whilst smoking using dirty bong water, you’re essentially introducing these difficult- to - treat pathogens directly to your lungs. Essentially, a dirty microbe is not just a nuisance, it’s a health risk. Research states that at least 80% of diseases that affect vital body organs are caused by microbes that grow from a biofilm. That being said, how often should one change their bong water? Moreover, how does one go about cleaning a bong? How Often Should I Change the Bong Water? Given the fact that it only takes a little under 24 hours for a biofilm to form on stagnant water, one should also change bong water just as regularly. In other words, one should change their bong water on a daily basis. This helps ensure that you’ve gotten rid of whatever pathogens that had started to grow in your bong water. Whilst changing your bong water, one should also clean their bong or dab rig before adding clean fresh water into it. Hence, one should know how to effectively clean their bong or oil rig. Below are a few simple steps on how to do it. Add salt and alcohol to the bong as well. After plugging the openings, shake the mixture to help remove any dirt and residue. Add some salt and alcohol in the plastic bag containing the down stem as well, and shake. The salt will be doing the scrubbing and helping get rid of stains and dirt. After you’re sure that the bong, bowl and down stem are clean, pour out the mixture. Once you’re done rinsing, let it dry before using it. Once it’s ready for use, add clean fresh water. Enjoy! If these steps really don't work on your glass bong or dab oil rig, it's a sign that you need to use glass bong cleaner to clean your bong. Below are some of the top signs that you need to change your bong water. Water discoloration. If your bong water is black, pink, grey, green or white in color, you need to change it. Water discoloration signifies the growth of mildew, mold, and bacteria just to name a few. In conclusion, dirty bong water is a serious health risk. Those that neglect their water pipes or bong water are likely to develop seriously, and probably, untreatable respiratory diseases such as pneumonia. A glass bong or dab rig, due to the water filtration system, helps protect your harmful residue contained in the smoke. However, by not cleaning your glass water pipe or using clean bong water, you’ll be doing yourself more harm than good. The cleaning process is simple and only takes a few minutes. Question! How often do you clean your bong? Let's share with others!